Sigh. Let me tell you about today, because it was perfect. More so because it didn't start out that way. I bet that most of you ladies, and maybe some of you guys know what it is like to wake up some mornings feeling blah. Like G-R-U-M-P-Y. That was me this morning. So here is the story about how Jesus helped me out today. We got up nice and early this morning (ahem, some earlier than others, Mr. 6:30am) so we could get to work on our mega paper due in a few weeks. As I said, the morning for me was gross- I felt mean, and irritable. Not good. Clay and I try to have some good Jesus time every morning, but this morning, I felt absolutely starved for the word. You know how you just know the day is going to be horrible unless Jesus intervenes and changes you? So I spent some time with him and basically begged him to redeem my day. Totally desperate. So.... did he do it? Looking back I can say that he totally DID!! I didn't realize it until a few minutes ago, but the day was awesome! And I managed not to have to apologize to most of the world for crummy behavior due to a bad mood. Here is just a fun picture. Creepy yet perfect. So, the day was hugely productive in that we made some serious headway on our paper, did our cultural interviews with some cool new friends in a funky new town, ate nachos AND sushi for dinner at 2 different restaurants, and laughed the whole day. Tell me if that isn't Jesus doing one of the things he does best- answering the prayers of his children when we turn to him for help, and showing that a day lived through his spirit blows the socks of a day we try to control ourselves. Hurray! 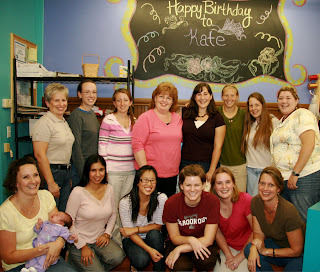 We celebrated Kate's bday yesterday by surprising her with a party at this pottery shop on Main Street. 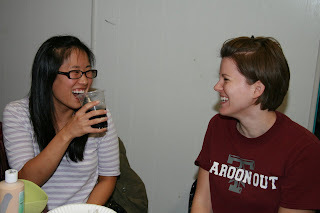 Super fun- it was great to hang out with the ladies outside of class. It was a lot of fun to take a break! We have been working hard! Lots of papers and reading to be done each week. Luckily the majority of the papers are "reflective" and don't require much research. They are all on good stuff though, so it makes it easier. After the Bday party, Clay and I headed to the Baker's (that's me laughing with Michelle above) and played Yahtzee into the night. It is funny how we are turning into gamers. It started with Speed Scrabble with the Meadows, then progressed to Settlers of Catan with Anna and Josh, and now here we are with Yahtzee with Michelle and Rich. Good times. Thank you for your emails and for your prayers. We haven't been very good about staying in contact with you, and we appreciate you remembering us :) We have been here almost 3 weeks- it feels like so much longer! We have been taught so much, and we are so thankful for these wise teachers. Here is a picture of our classroom. We are in here from 8:30 until lunch, and then until 3pm. There are about 25 of us, and we all get along really well- these people are truly wonderful. And our instructors are the best, too... this is getting cheesy. To sum up, we are having a lot of fun and learning a lot. One of the elements of CIT targets spiritual development. We’ve been building a solid foundation for life and ministry on one thing: the Gospel of Jesus. At first it seemed simple – almost too simple to spend weeks studying – but it has been one of the most life-changing subjects ever studied. The Gospel according to the Bible is that man is, and has been since the fall of Adam, sinful by nature. We’re born with it and dealt a losing hand from the beginning. It also says that God is holy and will not have sin in his presence. Bad news for us. That means that we’re locked and loaded on not only eternal life apart from him, but a life here on this earth living at odds with the Creator. The only remedy is being perfect, but it’s in our genetic makeup to live otherwise. The amazing part is that God, because of his incomprehensible love, came looking for us! This is where it get’s confusing and great. He sent his son Jesus to live a perfect life and die to pay the price for all sin. What’s more is God raised him from death to show his power over death and that eternal life can be ours through him! Now, in God's sight, we are perfect! We have two choices: we can choose to be presented to God through our own workings or through the workings of Christ – through the feeble efforts of sinful man or through the perfect life and death of God’s son. That’s all. It’s one or the other. Not both. We don’t choose to be presented through Christ and do our best to uphold our end of the deal. There is no deal. It’s done, bought, and paid for. We’re not in some sort of agreement that we can botch. It’s paid and over. Our “part of the deal” (if you will) is to live it and enjoy it! How about that!? Assuming we believe this to be true, it should be found in everything we do: how we relate to God (overwhelmed with gratitude and see ourselves as forgiven! ), how we relate to others (relentlessly forgive others and extend the grace that was so freely given to others), and how we see ourselves (no matter what we do, we are forgiven and shouldn’t tolerate guilt or feelings that we need to earn Gods approval – we have it!). There’s no area of life that should go untouched. Galatians 5:1 says “It is for freedom that Christ has set us free.” He didn’t free us from sin to earn anything. He freed us to be FREE. Some of you have asked how to get in touch with us via the good old postal service, so here are our addresses. One for mailing, another for shipping. Also, check out where CIT is on the map! Clay and I had a very abnormal day... and we loved it! We ended up having breakfast, lunch and dinner with some friends here, played Wii, went and played lazertag, did batting cages, and went to a coffee shop. For those of us that know us well, you know that this is NOT a typical day for us. We had so much FUN! Clay commented that we did more fun stuff today than we ever did on a day in college :) We even got some school work in today, too. The homework is piling up so I think we needed a day to chill and hang out with our new friends. Some of us ladies have started walking together in the evenings, and I wanted to show you some of the views we are seeing. It is incredible. We had a relaxing, fun weekend here in Union Mills. Yesterday the big news was that we went shopping, so yes, nice and uneventful :) We have been reading like crazy trying to finish 2 books they gave us to have read by Thursday. They both deal with being prepared for a cross-cultural life and the issues that you will face. I think the best thing I have learned so far is that pretty much EVERYONE struggles when they get to the field. All the emotions they talked about are ones I have dreaded, but now know that they are expected and don't mean you shouldn't be overseas. Sigh of relief. This morning we attended St. Francis Episcopalian church in Rutherfordton. It was very cool, and very different than what we are used to. We met some neat people and look forward to joining them next week. If any of you have read the Mitford series by Jan Karon, know that this church is just what I imagined The Lord's Chapel to be. I loved it. We were able to get a hold of Clay's family this weekend and all is well there after the hurricane. We are so thankful that our families are safe. Here we are at the top. It was so funny. We had been hearing how beautiful the view was at the top- the gorge and the river that would spread below us. Ha. The fog was so thick that we could not see a THING! The sky above looked the same as the earth below. Kind of surreal, actually. Like we were in a big white pillowcase or something, and it was absolutely silent. We had a lot of fun getting to know the group that went. There was a 30 minute LOST conversation in there somewhere which sufficiently alienated half the group, but was a blast for those of us interested. Oh how we love and miss our LOST :) Plans were made to meet up after dinner to watch a movie in the student center, so we all spent the evening together too. We are loving this. Onto things that we are not loving: like hurricane Ike dominating Galveston and Houston last night and continuing to do so this morning. I was able to talk to my family and all are well. However, 2 of Gma's 100 year-old oaks have been felled. This tree (right behind Gma's bedroom- good thing it fell back towards the barn!) always encompassed good memories for me. Paw Paw had tire swings strung from it when we were little, and we always sat under it on Easter afternoon after hunting eggs. And here is a picture of Grandma herself, the most valuable thing on her property. Old, special trees falling make me sad, but more than anything I am thankful that she is safe, as is the rest of my family. Be praying for the Houston area, and both of our families' continued safety. We have not been able to get a hold of Clay's parent's yet, but hopefully will soon. Will keep you posted. We made it to Union Mills, North Carolina yesterday to begin our 12 weeks of training before heading to Belgium! The drive up was great- we laughed the whole way there. We crossed through Atlanta and had lunch with Keith at The Varsity, this famous hotdog place that we have been hearing about from him since jr. high. So good. We spent last night getting to know some folks and then getting our apartment together. Today was our first day of CIT. Lots of introductions and vision casting for the next 2 1/2 months. After taking it easy for the last few months, we are quickly getting used to being in the classroom again. The whole group just got finished playing some volleyball which was a great way to unwind after a busy, informative day. Here is a video tour of our apartment we shot last night. We love you all! Be praying! Last week we had the privilege of spending time with Tom and Ramonda Lunsford – missionaries that Tomball Bible Church supports in Addis Ababa, Ethiopia. In 2005 when TBC sent me on a trip to make videos for a handful of their missionaries, the Lunsfords were stop number 4. I got to spend a week with them in Addis Ababa and see what a vital role they were playing with their organization (SIM). We really have no idea what kind of activities we’ll end up being a part of or where ministry will be most effective, so their advice was to start broad. Smart. 3. The team is important! We’ve heard this before, of course, but they encouraged us to not hesitate to devote substantial time to the development of our team. The more our team can depend on each other and trust each other, the more effective we’ll be.